When Dak’s Dad dies suddenly from a heart attack his world collapses. His mother is consumed by grief and everyone tells Dak he is being very brave but he does not want to be fussed over by well-meaning neighbours. To escape the house Dak visits the local aquarium where he spent many happy times with his Dad and to his astonishment he finds that his Dad is miraculously alive and is now a clownfish swimming in a tropical fish tank. Dak spends all his spare time there conversing with his Dad and enjoying his terrible jokes but he knows that he must keep this secret to himself as it might upset his Mum. And bizarre though it seems, it is entirely believable in the context that Dak’s Dad has become a clownfish. The aquarium owner Stephan who was a friend of Dak’s Dad’s suggests Dak helps his assistant Johnny feed the fish and Dak is delighted as it gives him a reason to be there. A few days later, Stephan’s niece Violet arrives to stay for the holidays while her parents are away. She is a feisty, prickly girl with issues of her own. Gradually the two become friends bonding when the aquarium is threatened with closure after a visit by the health and safety inspectors. Violet and Dak work on a campaign to save the aquarium hoping to make the community aware of what they would lose if it had to close; for Dak it is all the more pressing as he does not want to lose his Dad again. Inevitably everything comes to a head when Violet reveals the truth about Dak’s Dad. 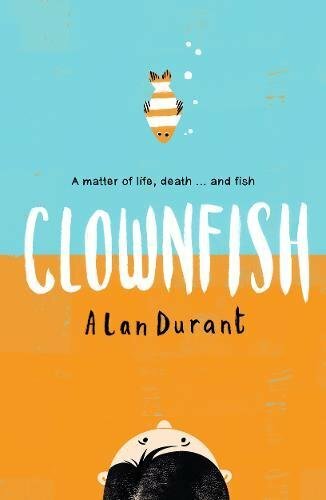 Dak feels betrayed and refuses to see Violet or visit the aquarium but it is only when he finally accepts her apology and returns to the aquarium to speak to his Dad that he understands the clownfish is just an ordinary fish and he finally breaks down. The story ends with a ceremony to dedicate a quote on the new aquarium wall to Dak’s Dad. This is a delightfully fresh, funny and poignant story. Grief and loss are handled delicately and sensitively yet the story is never mawkish or sentimental. Dak and Violet are particularly well-drawn characters and you are rooting for them both all the way as they come to a greater understanding of themselves and discover a strength and resilience they didn’t know they had. This would be a great story to read in class.